Sounds exotic, doesn’t it? Frolicking among the penguins. I always assumed that penguins made their home in the cold depths where no person wanted to venture, like Antarctica. Isn’t that where Happy Feet takes place? It wasn’t until I was an adult that I found out not ALL penguins are from Antarctica. Shocking, isn’t it? 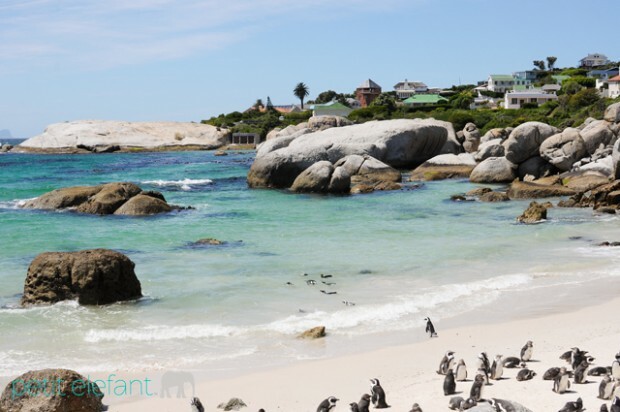 At the very bottom of Africa, there lives an appropriately named species of penguin called the African Penguin. They are more affectionately known as the Jackass Penguin. I first laid eyes on these exotic birds about twelve years ago when my son was not even a year old. His photo among the “jackasses” still brings a smile to my face as I remember what a novelty it would be to snap a photo of him right in the middle of them. Panic set in as they got a little too close for this Mama’s liking. He was oblivious to the scene when I scooped him up to safety. 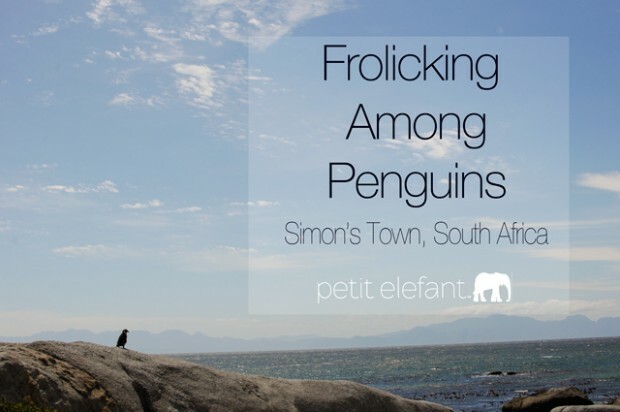 Nestled in the quaintness of Simon’s Town, South Africa, you will find a colony of jackasses in the form of penguins. 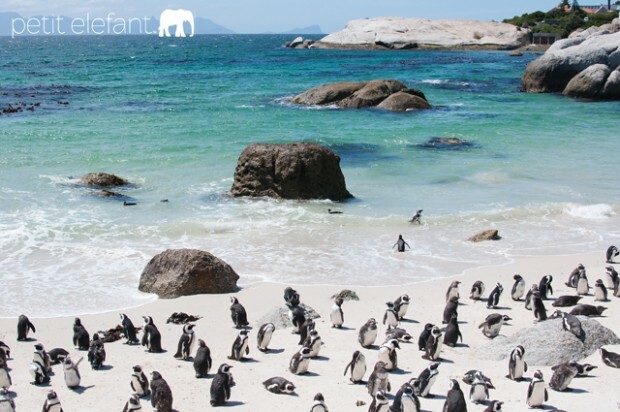 The shores of Boulders Beach are dotted with the black and white creatures. At the entrance, you can either play tourist and pay a small conservation fee (or pay nothing if you have a Sanpark all parks pass) to read the history and walk the boardwalk to the beach OR you can simply enter the beach for free and cross your fingers that someone from the colony has wandered from the flock a bit to join you for a swim. Either way these guys are not shy in front of the camera. They are quite used to the visitors that flock to them every year. Just please be kind to them. We don’t want this endangered species to go extinct! As always, there is always much to be learned during traveling adventures. Pay special attention to the season and what activities the birds might be up to. In January, the adolescents are molting, and the adults are eating up for breeding season. February to August is breeding season. September to October the penguins are at sea, feeding up for molting. November to December is molting season, and so the cycle begins again. Have you ever frolicked among penguins? My husband and I were able to travel to Cape Town back in 1998 for a company trip he won. It was so fun. I remember very well seeing the Jackass Penguins there. I was very surprised. Only picture penguins on the snow and ice. Seems like there were warning signs to not get too close. It is hard to wrap your head around seeing penguins somewhere other than the snow! There probably are warning signs but the intrigue draws you in so much! Hay, what a nice surprise to see this here!!! One of our favorite spots!!! It’s such a fun place to visit! Perfect photos. I love Africa very much; penguins, too.